Bias in School Composite Measures Using Value-Added | VAMboozled! Take a look at Fuller’s Figure 1. In this figure is a scatterplot that illustrates that there is indeed a “strong relationship” or “strong (co)relationship” between the percent of economically disadvantaged students and elementary schools’ SPP scores. 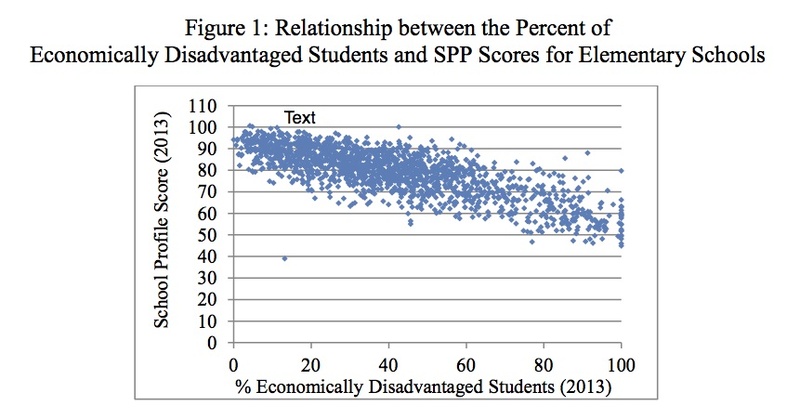 Put more simply, as the percentage of economically disadvantaged students goes up (moving from left to right on the x-axis), the SPP goes down (moving from top to bottom on the y-axis). The actual correlation coefficient illustrated, while not listed explicitly, is noted as being greater than r = –0.60. Note also the very few outliers, or schools that defy the trend as is often assumed to occur when “we” more fairly measure growth, give all types of students a fair chance to demonstrate growth, level the playing field for all, and the like. Figures 2 and 3 in the same document illustrate essentially the same things, but for middle schools (r = 0.65) and high schools (r = 0.68). In these cases the outliers are even less rare. This entry was posted in Research and tagged At-Risk Students, Bias, Causality, Consumer Alert!, EVAAS, Extraneous Variables, Fairness, High Stakes, Measurement Errors, Poverty, Research Study, States, Statistics, Tests, Unintended Consequences, US Dept of Education, Validity by Audrey Amrein-Beardsley. Bookmark the permalink. Correlations and scatter plots like this should make more US people realize that treating the conditional modes (or school/teacher residuals or VAM estimates or school/teacher effectiveness estimates or whatever phrase one likes … the VAMs and effectiveness phrases are of course loaded) as measuring the causal impact of schools/teachers on students is problematic. 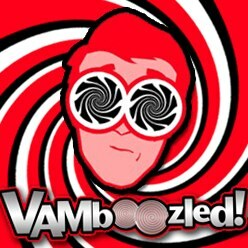 As shown in a previous post on this blog this does not always work http://vamboozled.com/acts-dan-wright-on-a-simple-vam-experiment/). Here is an example relevant to this report. Then I let R calculated the “VAMs''. The correlation between the VAMs and Neigh (found in R with cor.test(VAMs,Neigh)) is 0.98 meaning the VAMs variable is just measuring the Neighborhood effect (which also influenced the previous test scores). You can play with how the data are created to move this correlation around (and I could create data to mimic the correlations in the report if I had time). The point here is that we know that the correlation between Neigh and true value added should be ZERO (or close to it). It is not. The conditional modes that are found in the code above will only estimate true value-added in certain situations and there are various ways in which researchers could examine if these situational characteristics are at least plausible.